Decarbonisation of existing infrastructure systems requires a dynamic roll-out of technology at an unprecedented scale. 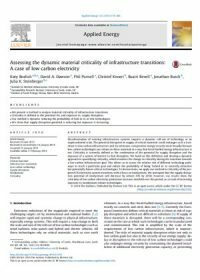 The potential disruption in supply of critical materials could endanger such a transition to low-carbon infrastructure and, by extension, compromise energy security more broadly because low carbon technologies are reliant on these materials in a way that fossil-fuelled energy infrastructure is not. This paper, authored by K. Roelich et al., was originally published in Applied Energy.